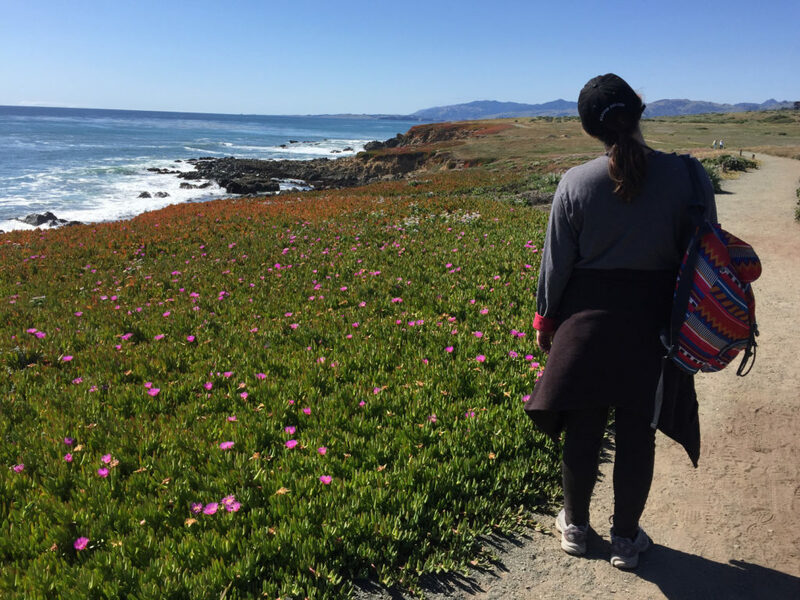 It all started in Cambria, California. 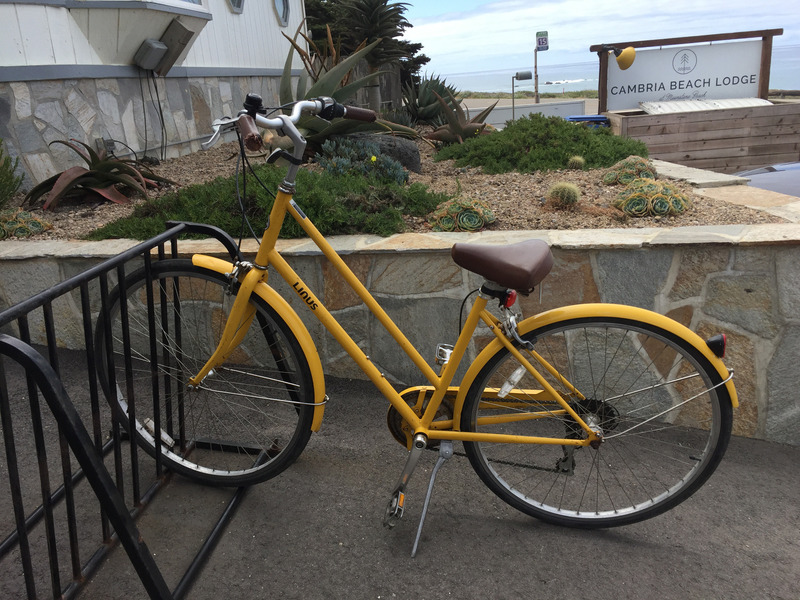 I was absurdly excited to find out that Cambria Beach Lodge had free bikes as one of their amenities. From the moment I heard about it, I started picturing the leisurely rides along the beach, my hair flowing behind me. In my wildest fantasies, I was probably also wearing a pristine white dress that would somehow stay pristine, even as I pedaled. Andy was, of course, riding beside me and a picnic basket would magically appear, as they do in dreams. Shockingly, none of this happened. Also, I may punch the next person who says, “it’s just like riding a bike” to me because, as it turns out, that might not be a positive thing at all. Also, somewhere in the back of my brain, I had the thought that since I’d spent some serious time on a stationary bike, riding a real bike wouldn’t be that much of a stretch. Yeah, turns out that’s not even remotely true. They aren’t built in the same way at all. Also, the stationary bikes rarely fall over. You know where this is going, don’t you? We started out. Andy, who has ridden a bike in the last 20 years (unlike myself), smoothly pedaled out onto the beach road. I leaped onto El Diablo and started wobbling like a bobblehead doll in a hyperactive child’s hands. Confident that I would get a feel for things, I started pedaling and moved the gears down to a more manageable setting. For some reason, the bike wanted to go to the right. Naturally, that meant that in my panic, I over-corrected left – into what could be traffic – which made me panic again and push back to the right (rinse, repeat). Luckily, on the way to the Preserve, there were very few cars. About two minutes into the process, I started feeling better. I thought I was less shaky. The carefree, pristine dress girl didn’t show up, but I was going straight and headed in a viable direction. My thighs were burning, but I was sure I could keep going. And then we got to the hill. I tried to downshift, but that meant that I couldn’t pedal fast enough to keep the bike steady. Once again, I panicked. Most people would just put their feet onto the ground to reset. But I’m short. And my feet didn’t touch the ground from the seat of the bike. So, to reset myself, I had to hurl myself forward and down. I did the maneuver expertly. Except once I was down, there was no way I could get enough momentum to go up the hill. So, I did what any rational adult would do. I cursed and slowly dragged the bike up the hill next to me until I got to a flat portion. As an aside, who designed bike seats? I mean, do professional bike riders just have numb asses? Are they in a constant state of pain? Seriously, every time I see race footage, I can’t help but remark about the grimace of dire discomfort that I can now relate to. I tried everything, C curves on my back to ease the contact, scooting forward and back towards the padding – nothing helped. Time to get those banana seats back! But good news! We made it to Fiscalini. We walked. We took pictures overlooking the ocean. And as our hike was nearing its close, I thought to myself, “how is the bike getting home?” Ha, the universe suggested that I was going to have to ride that thing again. Sure, I skidded into a break into the concrete roadway, but I kept going. In fact, it was all looking doable until I turned onto the main road. Andy was ahead of me, and just as he took the curve, I took the bushes. I know that I started to wobble on the gravel on the side of the road, and throwing myself forward to put my feet on the ground meant that my momentum was going in the same direction as the bike. Which was down. Down into the bushes. I was fine. But my ego was pretty bruised. A couple of people in cars stopped to see if I was okay. I gave them the thumbs up and began to pedal. When I, yep, once again pedaled into the bushes. Although, this time I didn’t fall. So, improvement? At this point, I conceded defeat and walked the bike up the road, where I met Andy who was pedaling back to find me. I blame El Diablo. And possibly my out-of-shape-ness and lack of road riding in the last 20 years. But yeah, I’m mostly blaming the bike.